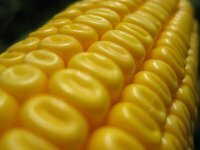 Corn–born in the Americas, domesticated in the Americas, first cultivated in the Americas, and most of its uses developed in America. No other food exemplifies this country like corn. In its honor, this is the first in a series of short articles exploring the history and culinary aspects of this versatile native grain. 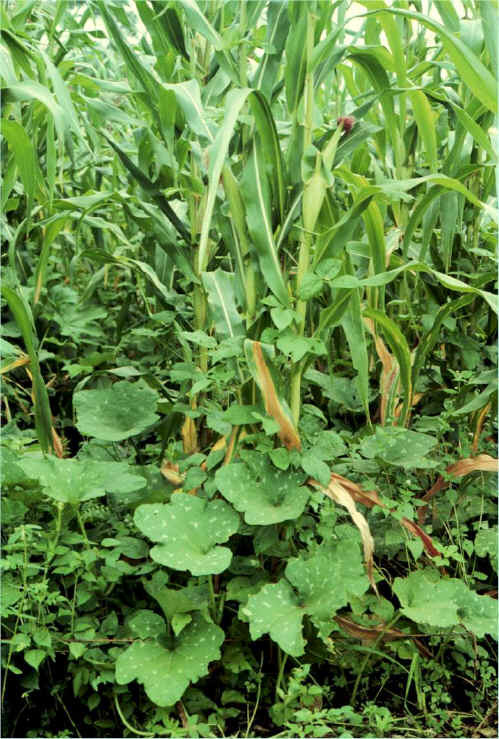 The origin of corn was a mystery for many years since nowhere in the world can it be found growing wild. It was only in the 1950s that Noble Prize winner Dr. George Beadle and a team of botanists, geneticists, and archeologists were able to identify a Mexican grass called teosinte as corn’s ancient ancestor. 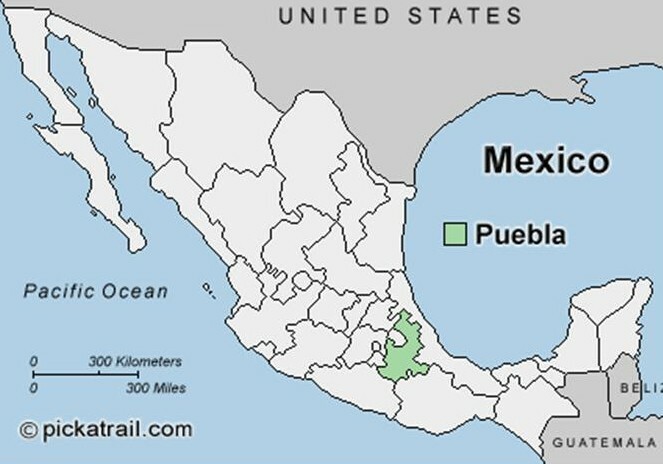 They also determined that it was first domesticated as early as 9,000 years ago in the Balsas River Valley near Puebla, Mexico. By the beginning of the thirteenth century, corn cultivation had spread throughout Mexico and into the U.S. Southwest. And by the end of the century it had migrated through middle and eastern America as far north as southeastern Canada, quickly becoming a major food staple of Native Americans, along with squash, beans, and a few other indigenous plants. Native American folklore is filled with stories about the origin of corn (known by the Native Americans as mahiz or maize, meaning “that which sustains us”). Most of these colorful stories, once preserved from generation to generation through oral interpretation, have only recently been written down. Here is one such story by a member of the Cherokee nation. Long, long ago when the Earth was very young, an old woman lived with her grandson in the shadow of a great mountain. The old woman gave her grandson a bow and arrow, and he went out and killed a small bird for them to eat. “You will be a great hunter!” said the grandmother. “We will have a feast.” She went into the small storeroom behind their house and brought out some dried corn. With the bird and the corn she made a delicious soup. Everyday the boy would hunt and everyday the grandmother would bring corn to add to the pot. One day the boy looked into the store house and saw that it was empty; but that evening the grandmother brought the corn as usual. The boy was so curious that the next evening he peeked carefully into the storehouse when the grandmother went for the corn. The grandmother rubbed her hand along the side of her body and out popped the corn from her side. The boy was confused and afraid. When the grandmother came out she understood that he had seen her. “Now I must die,” said the grandmother, “but you must do all I tell you so that when I am gone you still will have food. After I am dead you must clear the land behind the house where the sun shines longest and brightest. Drag my body over the land seven times and bury me in the field.” The next morning she was dead. The boy did exactly as the grandmother had told him. Everywhere a drop of the grandmother’s blood fell, a small plant grew. The boy kept the land clear around the plants. They grew tall and strong and soon had tassels which reminded the boy of his grandmother’s long hair. The wind rustling the long leaves sounded like her voice. Soon the plants grew heavy with ripe corn, enough to feed the boy and the people. 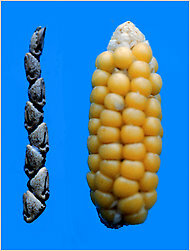 While there are many types of corn, the most common of these are flint, dent, sweet and popcorn. 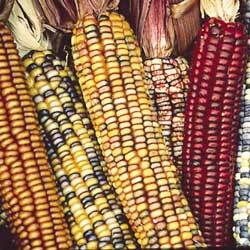 Flint corn, also known as “Indian corn” or “ornamental corn,” is generally multi-colored ranging from white to red to black. The kernels of flint corn have a hard outer layer said to be hard as flint, hence the name. Its low water content is resistant to freezing and therefore well suited for New England and the more northern part of the United States. Flint corn is one of the three kinds of corn cultivated by Native Americans. Dent corn, or “field corn” as called by some, is one of the most widely cultivated crops in the world. It can be either white or yellow and gets its name from the indention on the side of each mature kernel. While often used as livestock feed, it is also used to make processed foods such as starch, oil, and sweetener, or industrial products such as glue, ink, and cosmetics. 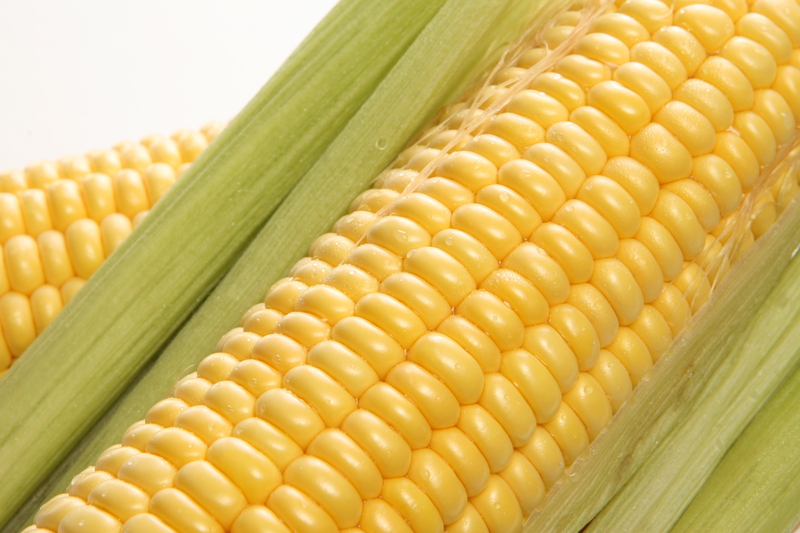 Sweet corn, sometimes referred to as “table corn,” is so named because it contains more sugar than other types and is grown for human enjoyment. It is rarely used for livestock feed, flour, oil, or industrial purposes. Popcorn is actually a type of flint corn. It has a moist, starchy center and hard shell that explodes when heated. It is the soft, starchy, white center that you enjoy at home or in movie theaters. 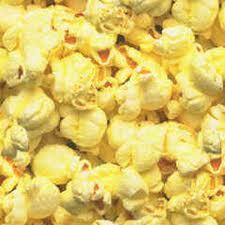 Popcorn is the oldest kind of corn, dating back to 3600 BC. Corn is not only an important part of our diet but our lives as well. Literally everywhere, it is almost impossible to go through our day without being touched in some way by corn–from the eggs we enjoyed for breakfast to the burger and soft drink we had for lunch. Corn is even in the fuel used to operate our automobiles. Over the next few weeks, we will take a look at some of the foods and food products brought to us by the grain we call corn.